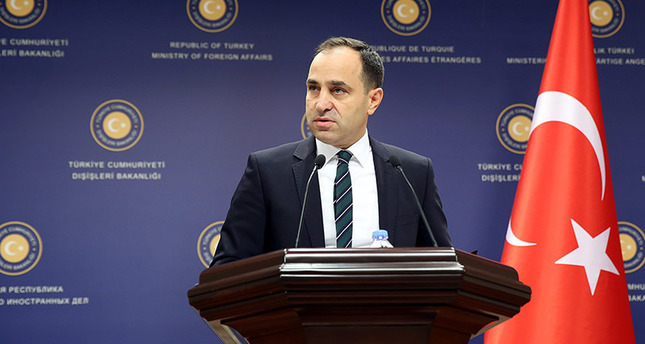 The agreed program of observation flights by Russian surveillance aircraft will not take place over Turkey, Ministry of Foreign Affairs Spokesperson Tanju Bilgiç has said on Thursday. Bilgiç said that an agreement could not be reached on the mission plan between the two countries. He also noted that Russia imposes restrictions on observations flights to be conducted over its soil, which is known by all members of the Open Skies Treaty. Ömer Çelik, spokesperson and vice president of the Justice and Development (AK) Party, stated that Russia requested to fly in parallel of Turkey's Syrian border. "Of course it is not possible due to security problems, problems in that area, and force majeures," Çelik said. "We have a hot and fresh crisis with Russia. We let the public interpret what a demand like 'flying overlapping the Syrian border' means in this environment." The surveillance would be performed under the terms of the 1992 Treaty on Open Skies which facilitates flights by unarmed surveillance craft over foreign states, according to a statement published on the Turkish General Staff's website. Turkey performs on average four surveillance flights over Russian territory every year, while Russian inspectors conduct two flights in Turkey, the statement added. A team of Turkish specialists was scheduled be on board to monitor the flights. Turkey signed the Open Skies Treaty in 1994. Last Friday, Turkey summoned Russian envoy over new violation of airspace by Russian SU-34 jet. Russian jet were warned in English and Russian before it violated Turkey's airspace for 20-25 seconds near southeastern Gaziantep province. Following Friday's breach, Turkish Air Force declared an 'orange alert' in key bases around the country, military sources said on Saturday. In late November, two Turkish F-16 fighter jets on an aerial patrol had intercepted a Russian military plane within the rules of engagement when it intruded into Turkish airspace on the Turkey-Syria border. The intruding jet was warned about the violation 10 times within five minutes before it was shot down. After the incident Russia imposed a range of unilateral economic sanctions against Turkey including a ban on food imports.